You are probably quite curious about the name of this bear hospital; well, here is Ambrosia herself, and we will tell you her story! Once upon a time, there was a girl who really enjoyed making teddy bears, but she felt there was one special bear who was waiting to be made, but who, for some reason, had not yet decided to appear. The girl bought the most beautiful alpaca she could find; it was soft and pink and she couldn't help stroking and stroking it, wandering what sort of bear would like to be made from it. So the girl cut out the pattern that was in her mind, and began creating the divine teddy bear. Soon, the bear was complete; Ambrosia had been realized! Now, all that was needed was some very special jewellery. The girl carefully plaited purple, blue and gold metal wire to form a circlet, and interlaced seed pearls and crystal beads. The girl then made Ambrosia a beautiful necklace from pink glass and crackle beads, and pearls. 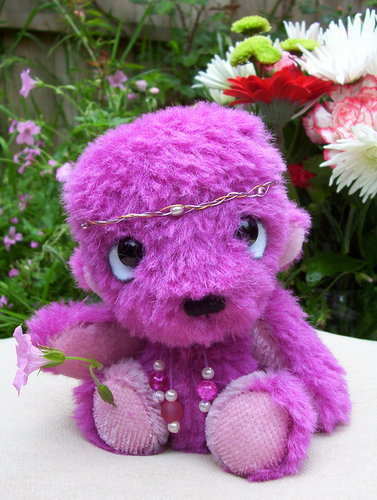 Ambrosia was a truly beautiful bear, and helped the girl make lots of other bears to be her friends. They all lived happily ever after in the beautiful, flowery garden. Here is Ambrosia offering you a pink flower!